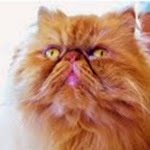 “Toby is a Persian cat 15 years old. Last year he was diagnosed with Kidney disease along with a UTI. Toby was fed, what we thought was a healthy diet. Toby would not eat the food and was getting weaker every day, he couldn't defecate and he wasn't urinating. You could see and feel every bone in his body, his eyes were glazed over and his coat was dull. Toby would sit and stare at the wall--he had given up. We made an appointment to speak to Susan Davis. She gave us all the information we needed to save Toby's life. Toby now eats a healthy diet and takes a few supplements such as Kidney Terrain, Kidney Health and Power Probiotic. The products all are easy to give and even a fussy cat will eat them. One of the most common diseases, as cats age, is kidney disease. Kidney disease may be hard to detect in the early stages, but some of the symptoms you may notice are increase urination, increased thirst, weight loss, vomiting, and discomfort in their back. Early intervention can be the key to your pet maintain a high quality of life, while battling kidney disease. A kidney-friendly diet, and supplements that help the kidney function (and remove toxins) can help a great deal, but pet owners might find it difficult to give supplements to finicky kitties. Fortunately, Kidney Health, is a product that contains a very palatable powder that just mixes into your cat's food. The enzyme, in Kidney Health, helps to break down protein, enhancing digestion and reducing the workload on the kidneys. We highly recommend the product as it seems to improve kidney values and symptoms and is an easy supplement to administer for CRF.